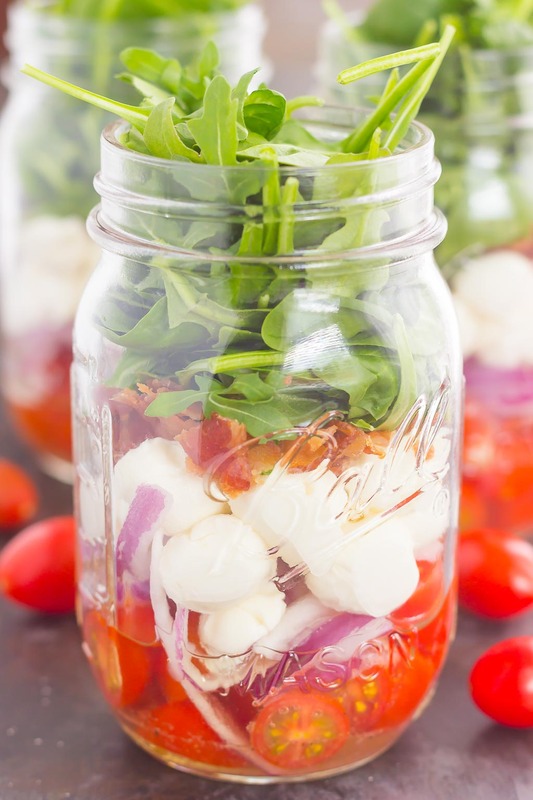 Caprese Mason Jar Salad makes a deliciously easy meal that’s perfect for just about any day. Classic caprese ingredients are layered in a mason jar, along with some red onion and crisp bacon for extra flavor. 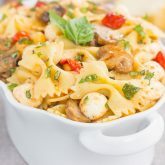 Great for meal prepping and perfect as a grab-n-go lunch, you’ll love the ease and taste of this classic salad that’s fun to make and even better to eat! Mason jar salads…where have you been all of my life? Mason jars filled with anything edible…where have you been hiding? I know that mason jars have been around for a hot minute now. And if we’re really getting technical, it’s been around for years and years. But, I’m talking about the popularity of mason jars come bridal shower favors, wedding favors, drink holders, hot chocolate mix makers, overnight oats keeper, that sort of thing. It’s taken the world by storm and doesn’t seem to be stopping anytime soon. Now, I’m no stranger to mason jar treats. After all, these Cake Batter Overnight Oats, those Pumpkin Pie Overnight Oats, all of my overnight oats are made and stored in mason jars for easy storing and eating. I also love making any kind of dessert in mason jars, such as these Strawberry White Chocolate Pound Cake Trifles, that No-Bake Apple Cinnamon Cheesecake, and this Raspberry Grapefruit Curd. But mason jar salads? I’ve never tried that before. I know you’re probably shaking your head and telling me to get with it. And guess what? I’m finally hopping on that train with one of my favorite salad combinations! Just incase you haven’t been around for long, let me tell you that I am obsessed with caprese anything! From this grilled cheese, to that pasta salad, those cups, and this bread, I love it all! I also love the concept of mason jar salads. 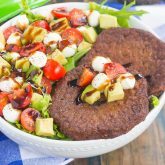 Easy to make, perfect for meal-prepping on the weekends, and so fun to along on picnics or get-togethers! 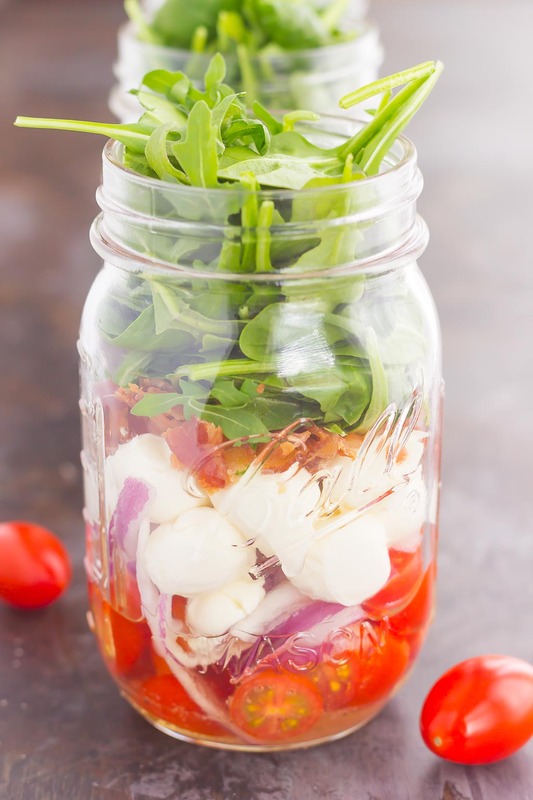 And when this Caprese Mason Jar Salad comes to life, I guarantee you’ll be hooked on it. I know I am! Here’s how the layering process goes: dressing on the bottom, cherry tomatoes, red onions, mozzarella pearls, bacon, and greens. It’s important to layer the jars in this order so that the dressing does not make the lettuce soggy. Sounds pretty easy, right? Now let’s talk about that dressing! Instead of using regular balsamic vinegar, I used white balsamic vinegar instead. It gives this salad a bit of a lighter flavor. It’s mixed together with a touch of olive oil, garlic powder, salt and pepper. And for added flavor, I added some red onion slices and crispy, crumbled bacon. It gives the a touch of something extra special! 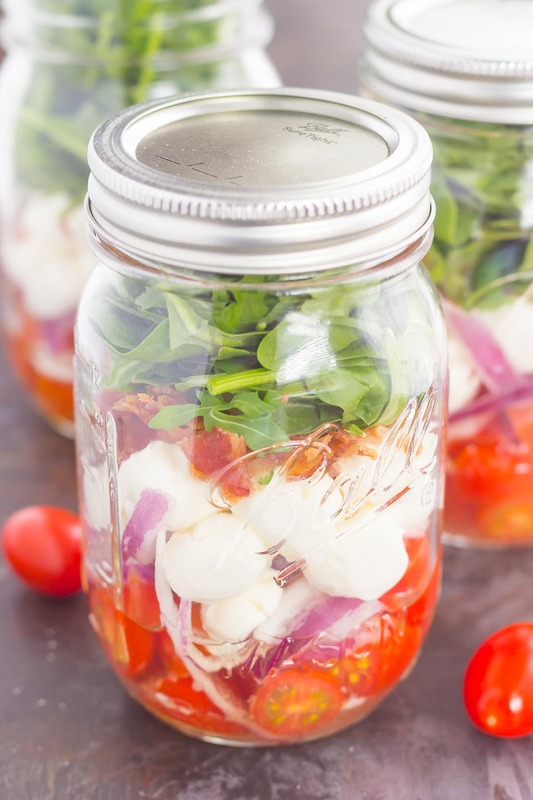 Did I mention how easy this Caprese Mason Jar Salad is to make? So easy! After the dressing is mixed, pour it into the bottom of your mason jar, add the veggies, mozzarella, bacon, and greens. And that’s it! These mason jars will store in the refridgerator for up to one week and make the best lunch on the go. This Caprese Mason Jar Salad would also be perfect for those summer parties, picnics, and get-togethers. Just be sure to have a bowl handy because it’s tough to eat this salad straight from the jar! 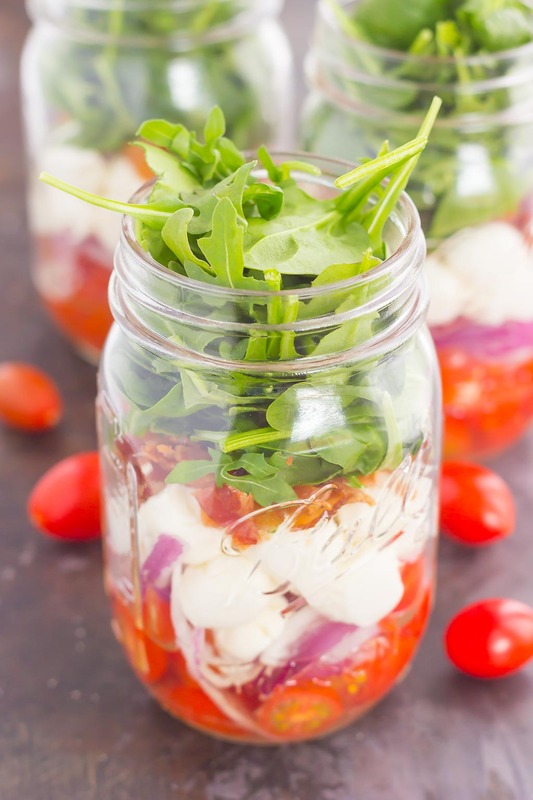 Caprese Mason Jar Salad makes a deliciously easy meal that's perfect for just about any day. Classic caprese ingredients are layered in a mason jar, along with some red onion and crisp bacon for extra flavor. 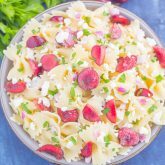 Great for meal prepping and perfect as a grab-n-go lunch, you'll love the ease and taste of this classic salad that's fun to make and even better to eat! In a small bowl, add white balsamic vinegar, olive oil, garlic powder, salt and pepper. Whisk to combine. Pour dressing into the bottom of four 12 ounce mason jars. Add the chopped tomatoes, mozzarella, red onion, and bacon to each jar. Top with lettuce and seal lid. Store jars in refrigerator until ready to serve. When ready to eat, pour jar into bowl. Mason jars will keep in refrigerator for up to 5 days. Caprese salad is my salad LOVE LANGUAGE, Gayle! This seriously looks so stunning and PERFECT for summer in those mason jars! Thanks for the salad love, Sarah! I LOVE mason jars for so many things and mason jar salads is on the top of the list! I make my husband one every day of the week for work (I have no idea why I don't make them for myself!) -- they're so great for meal prepping. 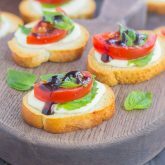 Caprese flavors are some of my favorite and these would be great when I get my first garden tomatoes! Aren't they the best? I wish I would've made these sooner. Thanks for the kind words, Marcie! This is such a great idea! Love this salad. Never made one in a Mason jar, but can't wait to try it! Thanks, Mira! Mason jar salads are so fun!